On the morning of December 14 1970, thousands of workers from the Gdansk shipyards downed tools and began marching into the city. Their objective was the local regional office of the Polish United Workers' Party (PZPR), the party that had ruled the People's Republic of Poland since 1952. The protestors were met by police units and fighting between the two sides lasted into the evening. The strike in Gdansk had been prompted by an announcement by the government that it was to increase the prices of key consumer goods - such as clothing, coal and food - to deal with Poland's worsening economic situation. Industrial output was lagging far behind Western Europe, agriculture was doing poorly, and there was a major lack of new housing for workers. Aside from the already dire situation that the state of the economy had left many workers in, the proposed price increases would have meant a reduction of 45% in real wages. Following the march on the PZPR office in Gdansk, the urban area comprising the three port cities of Gdansk, Gdynia and Sopot (known as the Trojmiasto) was placed under a telecommunications block, cutting them off from the rest of the country. The next day saw the strike spread, with workers at Gdansk Harbour and the Gdansk Ship Renovation Yard also stopping work. By the 16th almost all of Gdansk was on strike. A strike committee comprising of workers from each striking shipyard was formed, and many areas of the shipyards were occupied. A march on the PZPR offices was again organised, and during heavy fighting with the police it was burned to the ground by strikers. Upon hearing of the fighting in Gdansk, Wladyslaw Gomulka, first secretary of the PZPR ordered the army to surround the Trojmiasto and authorised the use of firearms against protestors. On December 17, having surrounded the harbour at Gdynia, troops fired on a large group of workers returning to the shipyard, killing or wounded hundreds. Incensed by news of the massacre, clashes between protestors and the army erupted throughout Gdynia. Workers at the Warski Shipyard in Szczecin, some 200 miles from Gdansk, walked off the job, and were joined by other workers in the city. Strikes also flared up in the coastal towns of Elblag, Slupsk and Tczew, as well as in Warsaw, Wroclaw, Bialystok and Nysa. Many of the workplaces affected were occupied by workers. Szczecin saw violence similar to that which took place in Gdansk; local party and union offices were set on fire, and the Szeczcin prison and police headquarters were also attacked. Workers again fought prolonged battles with the police. Recognising the seriousness of the situation, the government ordered the mobilisation of 5,000 policemen and 27,000 heavily armed troops to occupy the three cities of the Trojmiasto. Effectively finding themselves under martial law, strikers were compelled to return to their jobs. Official reports claimed that 45 people had been killed and over 1,000 wounded during the revolt, but later investigations show over 700 people were killed during fighting in Szczecin alone, and it later emerged that doctors in the city had been forced to sign death certificates of victims citing they had died of 'natural causes'. 3,000 people had been arrested for taking part in the uprising. For his haphazard handling of events Gomulka was forced to resign from the PZPR leadership, and was replaced by Edward Gierek. Strikes continued in Szczecin through December, and mass meetings at the shipyards took place daily, leading to the election of a strike committee. The role of this committee was unclear however, due in part to the majority of party members elected to it, and committee members often sought to restrain striking workers. Relations between workers and the committee grew strained with many workers feeling that the committee was ignoring decisions made at mass meetings, and often this would lead to committee members being recalled and replaced. Many workers grew restless of the constant stalling of those on the committee, and many strikers urged more militant action with steel workers threatening to sabotage their furnaces, and chemical workers threatening to blow up their plants. Again these calls were ignored by committee members, and the strike continued in the same form into January. Small numbers of workers began returning to work in mid-January, and the strike fell apart, having gained little. This period of calm proved to be only a short respite for the regime. In what can only be described as a serious error of judgement, the government released fake newspaper and television reports claiming that shipyard workers had promised increased productivity in support of Gierek's new leadership. The photographs and film footage released alongside the reports were of a mass meeting in the shipyard three years ago, and had been edited to include new banners and a different soundtrack. 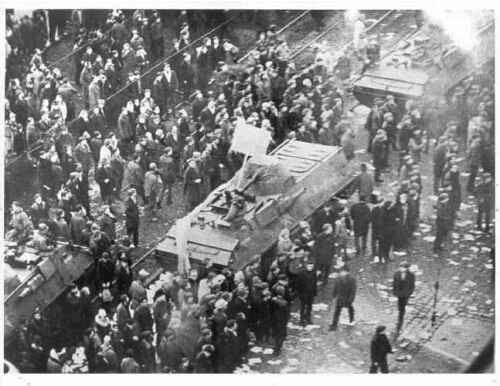 Within 24 hours the whole of Szeczcin was on strike, led again by the workers of the Warski Shipyard who occupied their yards, formed a militia to patrol the area, and set up defensive measures in case of an attack by the police or army. A larger, more democratic strike committee was formed, which resolved to demand a face to face meeting with Gierek. The meeting took place on January 24, and after nine hours of negotiations with workers' delegates Gierek agreed to many of their demands. These demands included; free and democratic elections to the shipyard union branch, pay for the duration of the strike, an apology and correction of the falsified news reports in the media, no victimisation of strikers, the publication of strikers demands in newspapers, and reversal of the price rises. All of these demands were granted, except the cancellation of the price rises, although this was fulfilled some weeks after the end of the strike under the pressure of further stoppages. A Workers' Commission was set up to oversee the implementation of the demands, and also to guarantee the release of arrested workers from prison and give aid to those injured in the fighting. The uprising of 1970 was the first time Polish workers had demanded changes of the regime through collective action and won. The events of December and January provided the practical experience for many Polish workers on which to base future struggles. Five months after the end of the strike the government again attempted to implement price increases, the effect of the December/January events was clear. Workers in the town of Radom attacked and burned down party offices, and strikers from factories in the Ursus suburb of Warsaw tore up the main railway lines into the city; within 24 hours the government backed down and cancelled the price rises. Nationwide strikes broke out again in 1976 over price rises, and the most lasting effect of 1970 was seen with the mass strikes of the 1980s which eventually led to the demise of the regime in 1989.